On Saturday 4th June 2016 the team were presented with two plaques – one for the Most Sponsorship for a Senior Team, and one for the Most Sponsorship for a New Team. 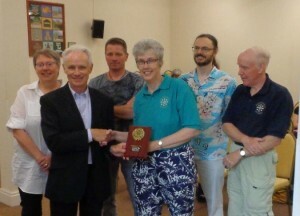 Here are Chris, Charles, Isabel, Mark and Reg at the presentation. Well Done! The team from the Minster successfully took part in the Swimarathon on 2nd April and swam a fantastic 101 lengths. They have collected over £2,000 for the bell fund and there is still a chance to sponsor them by clicking here. This is a picture of the team just before they swam. We are very proud of them. 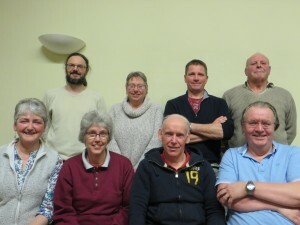 Eight brave swimmers from the Cheltenham Minster band of bell ringers are taking part in a Swimarathon to collect money for the Bell Appeal. 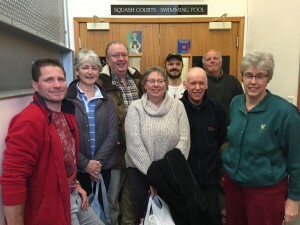 Isabel and Reg Hitchings, Mark Davies, Chris Hickey, Charles Beardsell, Robert Lee, Paul Staines and Cath Jack are taking part in the Cleeve Hill 41 Club Swimarathon on Saturday 2nd April at Cheltenham College pool. Teams raise sponsorship for every length that they can complete in a 45 minute session, with team members swimming in relay. Teams keep 80% of the sponsorship they raise for their own use – 41 Club use the rest to cover expenses with any remaining to assist local causes. There are various trophies awarded including one for the Maximum Distance and one for the Maximum Sponsorship. For ease of administration we have opened a mydonate page to sponsor the swimmers. Donations made through this site will go straight into the bell account and gift aid (if applicable) is also automatically transferred. Mydonate charge 15p for a debit card (whatever the amount) and 1.3% for credit cards. If you would like to sponsor the swimmers you can visit the mydonate website. If you prefer, you can send a cheque made payable to “Cheltenham Minster Bell Appeal” to Cheltenham Minster Bell Appeal, Cheltenham Minster, 44 Clarence Street, Cheltenham, GL50 4PL. If you are eligible for Gift Aid here is a GIFT AID DECLARATION FORM or you can contact us at ringing@cheltminsterbells.org.uk and we can email one to you.